As was explained earlier Artemia populations are widely distributed over the five continents in a variety of biotopes. Culture methods largely depend on pond size and available infrastructure. In this text we make a distinction between the following Artemia production systems. High saline lakes in which natural Artemia populations are present. Such lakes can be small (Egypt: Solar Lake) of medium size (California, USA: Mono Lake; Cyprus: Larnaca Lake) or large (Utah, USA: Great Salt Lake; Iran: Lake Urmia; Canada: Chaplin Lake). In these inland lakes population densities are usually low and mainly fluctuate in function of food availability, temperature and salinity. The size and/or often complete absence of suitable infrastructure makes management of such lakes very difficult, restricting the main activity to extensive harvesting of Artemia biomass and/or cysts. Mechanized operations consisting of several interconnected evaporation ponds and crystallizers. In these salt operations, ponds can have sizes of a few to several hundred hectares each with depths of 0.5 m up to 1.5 m. For a schematic outline of a typical permanent salt work see Fig. 4.5.1. (Port Said; Egypt: El Nasr Salina company). Sea water is pumped into the first pond and flows by gravity through the consecutive evaporation ponds. While passing through the pond system salinity levels gradually build up as a result of evaporation. As the salinity increases, salts with low solubility precipitate as carbonates and sulfates (Fig. 4.5.2.). Once the sea water has evaporated to about one tenth of its original volume (about 260 g.l-1), mother brine is pumped into the crystallizers where sodium chloride precipitates. Figure 4.5.1. Schematic outline of a typical salt work. Before all sodium chloride has crystallized, the mother liquor, now called bittern, has to be drained off. Otherwise the sodium chloride deposits will be contaminated with MgCl2, MgSO4 and KCl which start precipitating at this elevated salinity (Fig. 4.5.2.). The technique of salt production thus involves fractional crystallization of the salts in different ponds. To assure that the different salts precipitate in the correct pond, salinity in each pond is strictly controlled and during most of the year kept at a constant level. Brine shrimp are mainly found in ponds at intermediate salinity levels. As Artemia have no defense mechanisms against predators, the lowest salinity at which animals are found is also the upper salinity tolerance level of possible predators (minimum 80 g.l-1, maximum 140 g.l-1). From 250 g.l-1 onwards, animal density decreases. Although live animals can be found at higher salinity, the need of increased osmoregulatory activity, requiring higher energy inputs, negatively influences growth and reproduction, eventually leading to starvation and death. Cysts are produced in ponds having intermediate and high salinity (80 g.l-1 to 250 g.l-1). The population density depends on food availability, temperature and salinity. The availability of pumping facilities and intake canals allows manipulation of nutrient intake and salinity. Sometimes fertilization can further increase yields. Still, numbers of animals and thus yields per hectare are low. Moreover the stable conditions prevailing in the ponds of these salt works (constant salinity, limited fluctuations in oxygen as algal concentrations are fairly low, etc.) often results in stable populations in which the ovoviviparous reproduction mode dominates. The selective advantage of ovoviviparous females in these salt works, could also explain the decrease of cyst production which is very typical for stable biotopes (e.g. salt works in NE Brazil). In salt works Artemia should not only be considered as a valuable byproduct. The presence of brine shrimp also influences salt quality as well as quantity. In salt works algal blooms are common, not the least because of the increase of nutrient concentration with evaporation. The presence of algae in low salinity ponds is beneficial, as they color the water and thus assure increased solar heat absorption, eventually resulting in faster evaporation. At elevated salinity, if present in large numbers, algae and more specifically their dissolved organic excretion and decomposition products will prevent early precipitation of gypsum, because of increased viscosity of the water. In this case gypsum, which precipitates too late in the crystallizers together with the sodium chloride, will contaminate the salt, thus reducing its quality. Furthermore, accumulations of dying algae which turn black when oxidized, may also contaminate the salt and be the reason for the production of small salt crystals. In extreme situations the water viscosity might even become so high that salt precipitation is completely inhibited. The presence of Artemia is not only essential for the control of the algal blooms. The Artemia metabolites and/or decaying animals are also a suitable substrate for the development of the halophilic bacterium Halobacterium in the crystallization ponds. High concentrations of halophilic bacteria - causing the water to turn wine red - enhance heat absorption, thereby accelerating evaporation, but at the same time reduce concentrations of dissolved organic matter. This in turn leads to lower viscosity levels, promoting the formation of larger salt crystals, thus improving salt quality. Therefore, introducing and managing brine shrimp populations in salt works, where natural populations are not present, will improve profitability, even in situations where Artemia biomass and cyst yields are comparatively low. In most of the salt works natural Artemia populations are present. However, in some Artemia had to be introduced to improve the salt production. We are referring here to small artisanal salt works in the tropical-subtropical belt that are only operational during the dry season. In artisanal salt works ponds are only a few hundred square meters in size and have depths of 0.1 to 0.6 m. In Fig. 4.5.3. the lay-out of a typical artisanal salt farm is given (Vinh Tien salt co-operative - Viet Nam). Most salt farms only operate during a few months, when the balance evaporation/precipitation is positive. 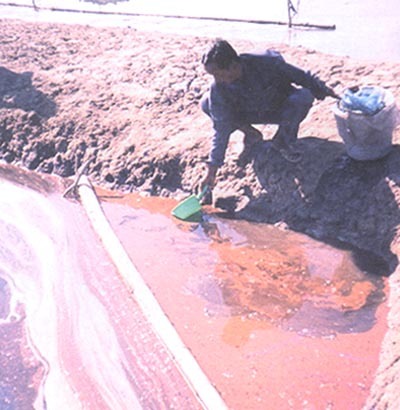 Salt production is abandoned during the rainy season, when evaporation ponds are often turned into fish/shrimp ponds. Although salt production in these salt streets is based on the same chemical and biological principles as in the large salt farms, production methods differ slightly (Vu Do Quynh and Nguyen Ngoc Lam, 1987). At the beginning of the production season all ponds are filled with sea water. Water is supplied by tidal inflow, but small portable pumps, wind mills and/or manually operated water-scoopers are also used, allowing for better manipulation of water and salinity levels. Figure 4.5.3. Lay-out of a typical artisanal salt farm. Water evaporates and, usually just before the next spring tide, all the water, now having a higher salinity than sea water, is concentrated in one pond. All other ponds are re-filled with sea water, which once again is evaporated and concentrated in a second pond. This process is repeated until a series of ponds is obtained in which salinity increases progressively, but not necessarily gradually! For the remainder of the season water is kept in each pond until the salinity reaches a predetermined level and is then allowed to flow into the next pond holding water of a higher salinity. Note that the salinity in the different ponds is not kept constant as in permanently operated salt works. Sometimes, to further increase evaporation, ponds are not refilled immediately but left dry for one or two days. During that time the bottom heats up, which further enhances evaporation. Once the salinity reaches 260 g.l-1, water is pumped to the crystallizers, where the sodium chloride precipitates. Artemia thrive in ponds where salinity is high enough to exclude predators (between 70 g.l-1 and 140 g.l-1). As seasonal systems often are small they are fairly easy to manipulate. Hence higher food levels and thus higher animal densities can be maintained. Also, factors such as temperature (shallow ponds), oxygen level (high algal density, use of organic manure) and salinity (discontinuous pumping) fluctuate creating an unstable environment. This, together with the fact that population cycles are yearly interrupted seems to favor oviparous reproduction. Integrated systems in which Artemia culture (high salinity) is combined with the culture of shrimp or fish (stocked in the ponds with lower salinity) also exist. As for the small salt works, brine shrimp culture usually depends on the availability of high saline water and is often limited to certain periods of the year. 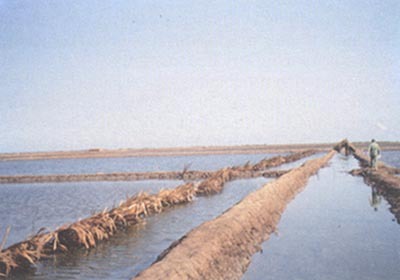 Management of these ponds is similar to the management of the Artemia ponds in artisanal salt farms. 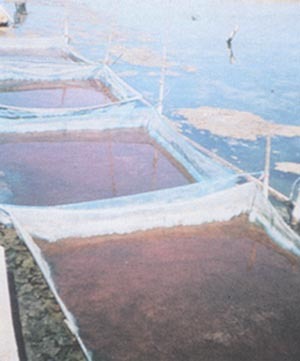 Intensive Artemia culture in ponds can also be set up separately from salt production. Ponds are filled with effluent of fish/shrimp hatcheries and/or grow-out ponds. As salinity in these systems are often too low to exclude predators (45 to 60 g.l-1), intake water is screened, using filter bags or cross-flow sieves. Agricultural waste products (e.g. rice bran) and chicken manure can be used as supplemental feeds. Systems can be continuous (at regular intervals small amounts of nauplii are added to the culture ponds) or discontinuous (cultures are stopped every two weeks). In what follows we will not give a detailed account of all aspects related to pond construction and site selection. We will only summarize those aspects which should be specifically applied for Artemia pond culture. For more detailed information we refer the reader to specialized handbooks for pond construction. The presence of sufficient amounts of high saline water is of course imperative, although filtration techniques to prevent predators from entering culture ponds can be applied for short term cultures (filtration less then 70 µm). Therefore, Artemia culture is mostly found in areas where evaporation rates are higher than precipitation rates during extended periods of the year (e.g. dry season of more than four months in the tropical-subtropical belt). Evaporation rates depend on temperature, wind velocity and relative humidity. Especially when integrating Artemia ponds in fish/shrimp farms, evaporation rates should be studied. On the other hand, the presence of solar salt farms in the neighbourhood is a clear indication that Artemia pond culture is possible during at least part of the year. As temperature also influences population dynamics directly, this climatological factor should receive special attention. Too low temperatures will result in slow growth and reproduction whereas high temperatures can be lethal. Note that optimal culture temperatures are strain dependent (see further). The land on which ponds will be constructed should be as flat as possible to allow easy construction of ponds with regular shapes. A gradual slope can eventually facilitate gravity flow in the pond complex. The choice between dugout (entirely excavated) and level ponds (bottom at practically the same depth as the surrounding land and water retained by dikes or levees) will depend on the type of ponds already in use. Locating the Artemia ponds lower than all other ponds is good practice, as the water flow into the ponds is much higher than the outflow (usually ponds are only drained at the end of the culture season). Making use of gravity or tidal currents to fill the ponds, even if only partially, will reduce pumping costs. Because long evaporation times are needed to produce high salinity water, leakage and/or infiltration rates should be minimal. Heavy clay soils with minimal contents of sand are the ideal substrate. As leakage is one of the most common problems in fish/shrimp farms and even in large salt works construction of a small pilot unit at the selected site, prior to embarking on the construction of large pond complexes, might avoid costly mistakes. An additional problem might be the presence of acid sulfate soils, often found in mangrove or swamp areas. Sometimes yellowish or rust-colored particles can be observed in the surface layers of acid sulfate soils. When exposed to air such soils form sulfuric acid, resulting in a pH drop in the water. At low pH it is very difficult to stimulate an algae bloom. As algae constitute an important food source for the Artemia, yields are low in such ponds. Treatment of acid-sulfate soils is possible (see further), but costly. The presence of lots of organic material in the pond bottom might also cause problems. Especially when used for dike construction, such earth tends to shrink, thus lowering the dike height considerably. Moreover, problems with oxygen depletion at the pond bottom, where organic material is decomposing, can arise. Using such soils over several years will lower the organic content. Nevertheless, many problems will have to be solved during the first years. 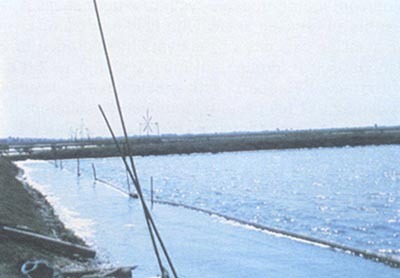 In large salt operations, adaptation of the existing ponds is normally not possible. However, ponds are mostly large, deep and have well constructed dikes. Through aging and the development of algal mats their bottoms are properly sealed. Therefore the only adaptation needed is the installation of screens to reduce the number of predators entering the evaporators. This is especially important in regions where predators are found at high salinity (e.g. the Cyprinodont fish Aphanius). Two types of filters can be used: filter bags (in plastic mosquito-screen, polyurethane or nylon), or stainless steel screens. The characteristics of each type of screening material are summarized in Table 4.5.1. Material available on most local markets, reasonably cheap. Large filtration area (depends on size bag). Filtration of particles with diameter of 2 to 5 mm possible depending on available material. Difficult to maintain (daily cleaning, high risk of damaging screens). Have to be replaced regularly. Only available in a few mesh sizes. Not suited for heavier debris (wood, plastic), which will damage the nets. Sometimes has to be imported. Rather expensive. Filtration area usually smaller than for filterbags, but screens with a mesh-size of 1 mm can be used if cleaned regularly. Easier to clean, screens with small mesh size should be cleaned daily. Stronger, can last several years and can retain heavier debris. As intake water is often heavily loaded with particles, step-by-step screening is recommended. Different screens, each with a smaller mesh size than the previous one, are placed one after the other. Screens with a large mesh size are best installed before the pumps, while screens with smaller mesh sizes are installed behind the pumps. If predators, resisting high salinity, are present, screening of the gates between the evaporation ponds is also recommended. Both stainless steel screens and filter bags should be cleaned regularly. Stainless steel screens are cleaned with a soft brush. Filter bags can be cleaned by reversing the bags. When cleaning or replacing filters, there is a risk of predators entering the culture ponds. Therefore before cleaning, predators (fish, shrimp) in the vicinity of the screens should be killed by spraying a mixture of urea and bleaching powder on the water surface (0.010 kg to 0.015 kg urea.m-3 and 0.007 to 0.01 kg bleaching powder 70%.m-3). In the artisanal saltworks ponds are very often operated at very small depths, sometimes resulting in too high water temperatures for Artemia (> 40°C) and promoting phytobenthos rather than the required phytoplankton. For integration of Artemia production, ponds should be deepened, dikes heightened and screens should be installed to prevent predators from entering the culture ponds. Under windy conditions (which often prevail in the afternoon hours in tropical/subtropical salt works) high wave action will enhance the evaporation. However to reduce foam formation (in which cysts get trapped) at the down wind side of the pond, wave breakers should be installed (Fig. 4.5.4.). These wave breakers will also act as cyst barriers and facilitate their harvesting. Figure 4.5.4. Floating bamboo poles used as wave breakers for the harvesting of Artemia cysts. Especially in regions with high air temperatures, deepening the ponds is crucial. Depths of 40 cm to 50 cm are to be recommended. High water levels are not only needed to prevent lethal water temperatures but at the same time reduce growth of benthic algae (i.e. sunlight cannot reach the pond bottom). Development of phytobenthos is undesirable as it is too large for Artemia to ingest and prevents normal development of micro algae (i.e macro algae remove nutrients more efficiently from pond water than micro algae). Moreover, floating phytobenthos reduces evaporation rates and hampers cyst collection. Ponds are usually deepened by digging a peripheral ditch and using the excavated earth to heighten the dikes. Although this is good practice, this method has two major draw-backs as evaporation rates depend upon the ratio pond surface: pond volume. In deeper ponds a decreased ratio leads to a slower increase in salinity. At the start of the culture season, this can limit the pumping of nutrient-rich water into the culture ponds, thus reducing Artemia growth and reproductive output. Also, more water is needed to fill such ponds. This might delay the start of the culture period in regions where no permanent stocks of high saline water are available (i.e. 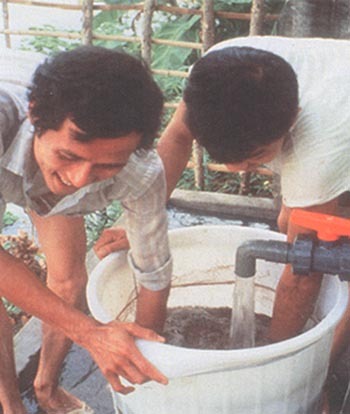 in Vietnam more than one extra month is needed, to completely fill ponds with a deep peripheral ditch). Alternatively the area in which Artemia is cultured can be reduced while the area allocated for evaporation is increased. Therefore, if the complete pond is deepened, low initial water levels (15 cm to 20 cm) are to be preferred unless water temperature is higher than 34°C or phytobenthos starts developing (low turbidity). A faster increase in salinity will allow more pumping and favor Artemia growth (cf. higher nutrient intake). Also, earlier inoculation of ponds will be possible. However, in ponds with peripheral ditches, only filling ditches at the onset of the culture season is bad practice. Not only will the ratio surface: volume be much smaller when compared to ponds with submerged central platforms but also risks of oxygen depletion in the ditch will be high (i.e. oxygen influx in the pond also depends upon ratio surface: volume). At the onset of the season a ratio pond surface: pond volume larger then 3:1 seems acceptable (pond surface expressed in m2, pond volume expressed in m3; water level above platform 0.2 m). Nonetheless, as this ratio largely depends upon the local evaporation rates, further experimentation at the site is advisable. To prevent leakage, newly constructed dikes need to be well compacted. When heightening old dikes, leaks will mostly occur at the interface of old and new soil. To prevent such leaks from occurring, the old dike should first be wetted and ripped before new soil is added. Dikes are often inhabited by crabs, digging holes through the dike. Filling nests with CaO and clay will reduce leaks caused by burrowing crabs. To prevent excessive erosion of the dikes, slopes should have a 1:1 ratio (height: width). Intake waters should also be screened to prevent predators from entering the culture ponds. 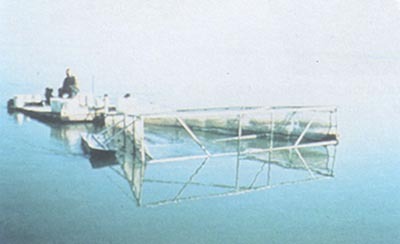 The same type of filters as described for large salt operations can be used. Moreover, the small size of the ponds allows the use of so-called filter boxes. In such a box a stainless-steel welded-wedge filter is installed under an adjustable angle (Fig. 4.5.5.). Water is lifted by a pump into an overhead compartment from where the water is drained over the filter screen. Mesh sizes of 120 mm have been tested with good result. The angle under which the screen is mounted influences the velocity of the water flow, which will determine the virtual mesh-opening of the filter. Figure 4.5.5. Close-up of welded-wedge filter screen and filtered zooplankton. When using such filters even small competitors such as copepods can be removed (up to 90%). Results are especially good, when Artemia culture periods are relatively short (6 to 8 weeks). The major draw-back is the high initial cost of these units (approx. 500 US$.m-2 of screen). This restricts their use to regions where high saline water is not abundant and/or where the presence of (small) predators seriously hampers Artemia culture. The chemicals used for liming are the oxides, hydroxides and silicates of calcium and magnesium. The liming substances most often used in aquaculture are agricultural lime, CaO or quicklime and Ca(OH)2 or hydrated lime. Normally ponds used to culture Artemia do not need liming. The high saline water often has a hardness of more than 50 mg CaCO3.l-1 (due to the presence of carbonates). Liming ponds with such hardness will not further improve yields. Liming can be considered when culture water has a pH of less than 7.5 and stimulating an algae bloom is difficult. Using CaO and Ca(OH)2 will result in a quick pH rise to about 10. This way possible pathogens and predators will be killed. CaO and Ca(OH)2 are therefore often used to disinfect the pond bottom. After two to three days, pH drops to 7.5, after which normal mineralization takes place. Recommended doses vary between 500 to 1000 kg CaCO3 per hectare, to be applied to dry pond bottoms. The lime requirement is highest for clay bottoms, acid bottoms and when the pond water has a low concentration of Ca2+ and Mg2+ (note that in high saline waters Ca2+ and Mg2+ concentrations are usually high). If liming is the standard, exact requirements should be determined by a qualified lab, using the technique as described by Boyd (1990). Whereas drying can be beneficial for most soils this is not true for acid-sulfate soils, often found in mangrove areas. When exposed to the air, the pyrite of these soils oxidizes to form sulfuric acid. Of course liming of these soils is possible. However, the quantities of lime needed are very high. A simpler method to reduce acidity is flushing ponds repeatedly after oxidation (exposing the soil to the air). This procedure can take a long time. Therefore, such type of bottom usually is kept submerged and extra layers of oxidized acid free soil are added on top of the original substrate. Culturing brine shrimp in regions with acid sulphate soils should be avoided. Removal of predators in large salt operations is very difficult. Careful screening of intake water (see 4.5.3.1) and restricting the culture of Artemia to high-salinity ponds is of the utmost importance. If large numbers of predators are found in the culture ponds manual removal (i.e. trawl nets) and killing fish/shrimp accumulating at the gates using a mixture of urea and bleach (0.01 to 0.015 kg urea.m-3 and 0.007 to 0.01 kg bleaching powder 70%.m-3), decreasing their number to acceptable levels, will be necessary. Initially ponds should only be filled to a level of 10 to 15 cm, in order to ensure maximum evaporation. Thus salinity lethal for predators will be obtained. Screening of the intake water will further reduce the number of predators in the pond (see further). As ponds often can not be drained completely, fish, crab and shrimp left in puddles, may be killed using rotenone (0.05 to 2.0 mg.l-1), tea-seed cake (15 mg.l-1), a combination of urea and hypochlorite (5 mg.l-1 urea and 24 h later 5 mg.l-1 hypochloride CaO) (see 4.5.4.1) or derris root (1 kg.150 m-3). Dipterex (2 mg.l-1) will kill smaller predators such as copepods and is also very toxic for shrimp. The degradation of rotenone, chlorine and CaO to non-toxic forms is fairly rapid (24 - 48 h). 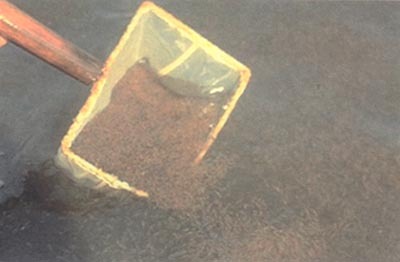 If on the other hand tea-seed cake or dipterex are used, ponds should be flushed prior to stocking animals. Fertilizers are added to the culture ponds to increase primary production (algae production). Increasing production is no simple process, especially in high saline water. Numerous factors influence the chemistry of the fertilizers (ion composition of sea water, pH, pond bottom, etc. ), algal growth (temperature, salinity, sunlight) and species composition (N:P ratio, selective grazing pressure). As can be seen in Fig. 4.5.6. fertilizers can enter the culture system via different pathways. The inorganic nutrients C, N, P enter the photo-autotrophic pathway, used by photosynthesising algae, whereas organic nutrients are processed through the heterotrophic pathways, used by heterotrophic bacteria, or are consumed directly by the target species. Some algae are better suited as food for Artemia than others (see further). Manipulation of algal composition is until now still more of an art than a science. Usually a high N:P ratio is recommended (N:P of 10) if the growth of green algae (Tetraselmis, Dunaliella) and diatoms (Chaetoceros, Navicula, Nitschia) is desirable. However, as phosphorus dissolves badly in salt water and is absorbed very quickly at the pond bottom, N:P ratios of 3 to 5 might be more appropriate. Figure 4.5.6. Nutrient - food interactions in a salt pond. If too much phosphorus is added, especially at high temperatures (> 28°C) and in the case of low turbidity (bottom visible), growth of benthic algae is promoted. Likewise, high phosphorus concentrations combined with low salinity seem to induce the growth of filamentous blue-green algae (e.g. Lyngbya, Oscillatoria). Both algae are often too large in size for ingestion by Artemia. Besides the N:P ratio, temperature, salinity, light intensity and pumping rates (input of new nutrients and CO2) also play an important role. High N:P ratios mostly stimulate green algae compared to diatoms at lower salinity and higher light intensities. Some green algae are poorly digested by Artemia (Nannochloropsis, Chlamydomonas). Finally, manipulation of algae populations also depends on the composition of the local algae community. The most dominant algae in the intake water often will also be the most dominant ones after fertilization. The nitrogen components available for the cultured species in the pond come from two sources. Part of the atmospheric N2 is taken up by nitrogen fixers (Azobacter sp. ; Aphanizomenon flos-aqua, Mycrocystis aeruginosa) and enters via this way the food cycle. The other source of nitrogen is organic material in the intake water. Algae use nitrate (NO3-) and ammonium (NH4+). As the nitrogen influx in the system depends completely on biochemical processes (degradation of organic matter by bacteria) and the nutrient level in the intake water, nitrogen often limits algae growth. The use of nitrogen fertilizers is therefore widespread. Four types of inorganic nitrogen fertilizers are available. Acidifying effect (acidity -33.6 kg CaCO3.100kg-1 fertilizer). NH4+ can replace Ca and Mg in the bottom, as a result decrease buffer capacity and/or stimulate precipitation of phosphates and sulphates. Fast action (nitrate directly available for the algae). Acidifying affect (acidity -25.2kg CaCO3.100 kg -1 fertilizer). Lowers temperature. Slow action. Readily soluble. The need of nitrogen fertilization varies largely and should be determined experimentally for every site. Usually, adding between 1 mg.l-1 (eutrophic intake water) to 10 mg.l-1 (oligotrophic water) nitrogen will induce an algae bloom. * Pre-dissolving the fertilizers in fresh water, even when using liquid fertilizers enhances proper distribution over the complete pond. If fertilizers dissolve easily, hanging a bag behind a boat and dragging it through the culture pond gives an even better distribution. Platforms in front of the inlet can also be used. * Liquid fertilizers, containing nitrate are more effective than other nitrogen fertilizers. * Do not fertilize on a cloudy day (reduced sunlight) as algae growth will be limited by the low light levels. * It is best to fertilize only the low salinity ponds in a flow-through system. Initiating an algae bloom in high salinity ponds is difficult and can take more than one month. The algae and organic matter created in the low salinity ponds are drained to the high salinity ponds and are there available as food. * Conditions in the fertilizer ponds should be kept as constant as possible to enhance optimal growth conditions for the desired algae. * The use of inorganic fertilizers in Artemia culture ponds is not recommended (except before introducing the nauplii) as algal densities are not limited by the nutrient concentrations but rather by the grazing pressure exercised by the brine shrimp. In large salt operations costs might limit the use of fertilizers. Regular pumping is often more effective in controlling the Artemia standing crop. When pumping, new nutrients and CO2 enter the culture ponds. This will stimulate algal growth, especially in areas where intake water is nutrient rich (turbidities less than 40 cm), no additional fertilization should be used. If the intake water contains only low nitrogen levels, fertilizing low salinity ponds could enhance Artemia production. As pumping influences the retention time of the nutrients in the ponds (i.e. at high pumping rates algae will not have time to take up nutrients) fertilization should be combined with lower pumping rates, in systems with short retention times. * Calculate the amount of fertilizer needed to increase the nitrogen level with 1 mg.l-1 (1 ppm). Example: pond volume = 1000 m3. As ppm = g.m-3 in total 1,000 g has to be added to the pond. If urea is used, (1000: 0.46) = 2,174 g urea must be added to the pond (urea contains only 46% N). * If algae do not develop after 2 days, add a new dose of 1 mg.l-1 until a turbidity of 30 to 40 cm is obtained. * Once an algae population is established, fertilize at least once a week. If during the week turbidity drops under 50 cm, decrease time between fertilizations or add more fertilizer. If turbidity becomes higher than 15cm, increase time between fertilizations or add less fertilizer. * Regular pumping adding new CO2 to the water and diluting cultures is essential. Ideally, algae turbidity should be kept between 20 and 40 cm in the Artemia culture ponds, through regular water intake from the fertilization ponds. Turbidities of less than 20 cm might result in oxygen stress at night, especially when temperatures are high. Also other factors influencing primary production should be taken into account (i.e. temperatures, low sunlight on cloudy days). If climatic conditions are limiting algae growth, extra fertilization will not increase primary production. As with nitrogen, phosphorus enters the culture ponds with the intake water in the form of organic material which only becomes available through bacterial decomposition. Phosphorus is also found in the soil where it is bound under the form of AlPO4.2H20 or FePO4.2H2O (sometimes 300 times more than in the water). This phosphorus can be released into the water. The processes describing this release are up to now poorly understood. It is however clear that bacteria together with the Fe-ion play an important role. In anaerobic conditions and when the pH is low, phosphates are released into the water. Most phosphorus fertilizers precipitate, especially in salt water ponds (i.e. reaction with Ca2+). Phosphorus is also quickly absorbed at the pond bottom. In cases where the use of phosphorus fertilizers is desirable, fertilizers with a small grain size which dissolve easily in water, should be selected. Pre-dissolving the fertilizer in freshwater will improve its availability. In Table 4.5.3. we list the characteristics of some phosphorus fertilizers. The rule for phosphorus fertilization is small quantities as often as possible. Adding phosphorus twice a week is normal practice. Again, no exact rules specifying the amounts of phosphorus fertilizer can be given. We therefore recommend to follow the same procedure as described for nitrogen fertilizer. But as a rule of thumb three to five times less phosphorus than nitrogen should be added to culture ponds. With the appearance of inorganic fertilizers the use of organic fertilizers has been questioned. In Table 4.5.4. we summarize advantages and disadvantages of organic fertilizers. The organic fertilizers most often used in aquaculture are chicken, quail and duck manure. Cow, pig and goat dung have also been used but seem to stimulate phytobenthos. Cottonseed meal, rice bran and other agricultural waste products have also been used. The use of rice bran is only recommended if there is a serious food shortage (i.e. very slow growth of the animals). As these products are expensive and contain a lot of undigestable fiber, which eventually accumulates on the pond bottom, they should only be used for a limited period of time. Recommended levels of organic manure are 0.5 to 1.25 ton.ha-1 at the start of the production season with dressings of 100 to 200 kg.ha-1 every 2 to 3 days. In Vietnam, about 500 kg.ha-1.week-1 of chicken manure is used as soon as algae concentrations decrease. When adding organic fertilizers to culture ponds, water should be turbid, otherwise benthic algae most certainly will develop. Table 4.5.4. Advantages and disadvantages of organic fertilizers. Organic fertilizers contain apart from nitrogen and phosphorus other minerals which can have a beneficial effect on the plankton growth. Organic fertilizers have a very beneficial effect on the pond bottom. The adsorption capacity will be greatly increased (higher potential buffer capacity) and the microflora will be enhanced. However, an increase in bacteria is only beneficial if the C:N ratio is lower than 30. If this is not the case bacteria might use nitrogen components from the water column to sustain their growth. In this case adding inorganic nitrogen fertilizers is recommended. Organic fertilizers contain protein, fat and fibre. Fertilizer particles coated with bacteria can be used directly as food by the cultured species. Artemia, a non selective filter feeder obtains part of its food in this way. Organic fertilizers often float (chicken manure). Therefore the loss of phosphorus is reduced. By using organic fertilizers one usually recycles a waste product, which otherwise would have been lost. The composition of organic fertilizers is variable. This makes standardization of the fertilization procedures difficult. As they also contain considerable amounts of phosphorus, problems with benthic and blue green algae can arise. Organic fertilizers have to be decomposed. Their action is therefore slower, increasing the risk of losses. As organic fertilizers stimulate bacterial growth, their use greatly increases the oxygen demand. Using too much fertilizer can result in oxygen depletion and mortality of the cultured species. Increased bacterial activity also increases the acidity of the bottom. The use of organic fertilizers increases the risk of infections. This risk can be reduced by composting the manure before use. One of the main disadvantages of organic fertilizers is their bulk, which causes high transportation and labour costs. Often special facilities where the manure can be stored have to be constructed. If Artemia ponds are converted to shrimp ponds, all organic waste accumulated at the bottom has to be removed. This is also an expensive and labour intensive job. A common practice is to use a combination of inorganic and organic fertilizers. While inorganic fertilizers stimulate algae growth and mineralization of the organic fertilizer (lower C:N ratio), the organic fertilizer is used as direct food for the Artemia and via slow release of nutrients, especially phosphorus further stimulates algae growth. Normally inorganic fertilizers are added to the fertilization ponds or canals, while manure can be added directly to the Artemia culture ponds or to the fertilization ponds. If possible, salinity in the fertilization ponds should be kept above 50 g.l-1. At this salinity blue green algae (most of which can not be taken up by Artemia) will be outcompeted by more suitable green algae and diatoms. As discussed earlier fertilization ponds - which are per definition heavily fertilized - should be deep (preferably more than 0.7 m) to prevent the development of benthic algae. The introduction of a foreign Artemia strain should be considered very carefully, especially in those habitats where it will result in the establishment of a permanent population as in the salt works in NE Brazil. In such cases the suitability of the strain for use in aquaculture especially with regard to its cysts characteristics, will be a determining factor. When the idea is to replace a poor performing strain, in terms of its limited effect on algae removal in the salt production process, or its unsuitable characteristics for use in aquaculture (e.g. large cysts, particular diapause or hatching characteristics) all possible efforts should be made to collect, process and store a sufficient quantity of good hatching cysts. Samples should be sent to the Artemia Reference Center for preservation of this genepool of Artemia in the Artemia cyst bank. As mentioned earlier Artemia strains differ widely in ecological tolerance ranges and characteristics for use in aquaculture. Therefore, the selection of the strain best adapted to the particular ecological conditions of the site and/or most suitable for its later application in aquaculture is very important. Strain selection can be based on the literature data for growth, reproductive characteristics and especially temperature/salinity tolerance. Summarizing, a strain exhibiting maximal growth and having a high reproductive output at the prevailing temperature/salinity regime in the ponds should be selected. Usually strains producing small cysts and nauplii are to be preferred unless production of biomass is the main objective. In the latter case selecting a fast growing strain having a dominant ovoviviparous reproduction is recommended. If a local strain is present, one should be sure that the newly-introduced strain can outcompete this local one. The strain with the highest number of offspring under the local environmental conditions will eventually outcompete the other. However, initial population density also plays an important role (most abundant strain often wins). Therefore the new strain should be introduced at a moment when density of the local strain is at its lowest point. · Hatching containers should be placed in shaded areas to prevent excessive heating by direct sunlight. · Water should be filtered, preferably using a 1µm filter bag (GAF). · If water remains turbid after filtration, lower the salinity to 20 g.l-1 and add no more than 1 g cysts.l-1 to the hatching containers. · Provide sufficient aeration and illumination, especially when cysts are incubated in late afternoon or evening. The quantity of cysts needed to obtain the number of nauplii required for inoculation (and taking into account a 30% mortality at the time of stocking) is calculated from the pond volume and the hatching efficiency of the selected batch. Take into account that as hatching is suboptimal, the hatching percent might be lower than expected (often only 75%). It is essential to harvest the nauplii in the first instar stage. Older instar stages, will not survive the salinity shock as well when transferred from the hatching vessel (20 g.l-1 to 35 g.l-1) to the culture ponds (80 g.l-1 upwards). Therefore, regular checks through subsampling of the hatching containers is recommended. Depending on the size of the ponds a stocking density of 5 - 10 nauplii.l-1 should be considered. However in large operations practical considerations such as facilities to hatch out the required amount of cysts might further limit the stocking density. Animals should be stocked as early as possible in the brine circuit where no predators are found. Downstream ponds at higher salinity need not necessarily be inoculated since they will be stocked gradually with Artemia drained from the inoculated ponds. When algae blooms are a problem, stocking of several ponds might be needed. The initial stocking density can be as high as 100 nauplii.l-1 in ponds with a turbidity between 15 and 25 cm. However, at such high stocking densities oxygen might become limiting, especially when water temperatures are high. At lower turbidity (less than 25 cm) stocking density should be decreased to 50 to 70 nauplii.l-1. Stocking at high density is thought to stimulate oviparous reproduction. However, if initial stocking density is high, animals will grow more slowly due to food limitations. In extreme cases the brine shrimp will even starve before reaching maturity. Also, at high temperatures oxygen depletions further interfere with growth and reproduction. Stocking at lower density might increase the proportion of females in ovoviviparous mode of reproduction. But as more food is available per individual animals grow faster and females have larger broods. As a result, final cyst yields do not necessarily decrease when lower stocking densities are applied. Very regular monitoring of the ponds is necessary to allow correct management. The type of sampling program largely depends on the goals. If production is the main objective only those variables necessary to provide essential decision-making information should be followed (temperature, salinity, turbidity, number of females and brood size). On the other hand more extensive sampling programs will be needed when research programs are carried out in the culture ponds, allowing at least for relative estimates of population numbers. The most important rule when collecting data is standardization! Select fixed sampling stations at every site and mark them. Use always the same (well-maintained and operational) equipment and (correct) technique when measuring a certain parameter or when analyzing samples. Keep careful records of your data. In Fig. 4.5.7. we give a flow chart of a possible monitoring and managing program for large salt operations. In Fig. 4.5.8. we give a flow-chart, showing management in a smaller unit. As no two sites are identical, these flow-charts should only be considered as guidelines. In the following paragraphs we will discuss the most important environmental parameters. For each parameter we give measurement procedures, discuss their effects on the Artemia population and, where possible, explain how to manipulate them. Figure 4.5.7. Flow chart of a possible monitoring and managing program for large salt operations. Figure 4.5.8. Flow chart of a possible monitoring and managing program for a smaller unit. For production purposes the following procedure is recommended. Twice a week samples (e.g. 10 samples.ha-1) are collected in the different culture ponds. Samples should be collected at fixed sampling stations located in as many different strata as possible. · Per sample site 5 -10 l water is filtered over a sieve (100 µm). · A conical net is dragged over a certain distance through the water. Drags can be horizontal or vertical. However, mesh size and diameter of the sampling net depends on the volume of water sampled, which in turn depends on the population density in the pond. If population density is high, nets with a diameter of 30 - 50 cm and mesh size of 100 µm can be used. In large ponds where population density is low, larger nets (diameter up to 1 m) are dragged over a longer distance. To prevent clogging, only the distal part of the net has a small mesh size (100 µm). The remainder of the net can have a mesh size of 300 - 500 µm. The scores for each life stage of all samples taken in one pond are summed and plotted in time. Although such estimates are not accurate (do not give the exact number of animals per liter), they are precise (reflect correctly the variations in abundance). Such curves (Fig. 4.5.9.) show how a population evolves and allow for adaptation of the management procedures (see Fig 4.5.7. and Fig. 4.5.8.). Figure 4.5.9. Population evaluation curves. Apart from population composition, the reproductive status of the females can also be used as an indicator for the health status of the Artemia population. Large broods, and short retention times between broods (e.g. females having both developing ovary and filled uterus) show that pond conditions are good. · Are the guts of the animals completely filled with an amorph mass, especially in the morning (control under microscope)? If guts are only partly filled, animals are underfed. · Are the faecal pellets well filled? Keep some animals in a jar filled with pond water and collect pellets from the bottom. Check pellets under a microscope. Are the pellets short or do animals tail long pellets? If tailing pellets are observed together with only partly filled pellets, animals are underfed. If tailing pellets are observed, but pellets and guts are well filled, food is not digested properly, which can be due to overfeeding or the presence of unsuitable algae. · Swimming behaviour of the animals. Do they form clusters? Do they swim quickly/continuously? If not, animals are stressed. · Standardize your sampling method. Take samples always at the same spot, the same way, the same time of day using the same sampling equipment. · Check the distribution pattern of your population at different times of the day. Often populations are more homogeneously distributed early in the morning and at night. Taking samples at this moment will reduce variation between pond samples. Variation can of course also be reduced via sampling only one or two strata (i.e. strata where highest number of animals are found). This might give a precise estimate, but note that the estimate is certainly inaccurate. · Taking bigger samples reduces the variance. Therefore, transects taken with a trawl net give more precise estimates than point samples. Also, when taking sufficiently long transects, more strata are included in the sampling program. · When subsampling your samples, make sure your subsamples contain between 50 and 150 animals (cf. adapt your dilution factor). In smaller subsamples the coefficient of variance increases, while the risk of counting errors increases with larger sample size. Also, take enough subsamples per sample (at least three). As for the samples, standardize methodology. · A quick way to estimate standing crop is to use sample volume as an estimate. After fixing the sample with lugol or formalin, biomass is transferred to a measuring cylinder, where it is allowed to settle for 10 min after which the volume is read. As sample volume can be determined quickly, increasing the number of samples per pond is possible. Dirt present in the sample or salt sticking to the animals has only a minor impact on sample volume. This is not true for dry weight. Using dry weight as an estimator is only possible if samples can be cleaned properly, which is a time consuming activity. Wet weight should not be used as it is very unprecise and inaccurate. Of course sample volume depends both on animal abundance and animal size. As both cyst production and biomass production mainly depend on the number of large animals, volume usually reflects correctly the status of the population. · If the aim of the study is to predict cyst production, both sample volume and female abundance are good predictors. Temperature can be measured with a glass thermometer. The thermometer has to be read while still submerged in the water, otherwise recorded values will be lowered due to evaporation on the measuring bulb. In deeper ponds, the water may be stratified and the temperatures at the surface and bottom may differ considerably. In extreme situations this can lead to lethally high temperatures and low oxygen concentrations at the pond bottom, especially in situations of salinity stratification (i.e. green-house effect resulting from the low saline top layer). Such situation, indicated by surfacing of large clouds of Artemia and animals of a dark red color, has a negative influence on growth and survival. Regular pumping or raking of the pond bottom will prevent stratification. Salinity is best measured with a refractometer, which can be corrected for different temperatures. As algal concentration and other suspended materials influence the refractive index, it is recommended to filter the sample before measurement. Salinity is important in setting the lower and upper limit between which Artemia can thrive. As mentioned before, the upper salinity tolerance level of predators (fish, Corixidae) determines from which salinity onwards reasonable numbers of Artemia can be found. At too high salinity (> 250 g.l-1) water becomes toxic for Artemia Under field conditions, oviparous reproduction is often found at high salinity. The lower oxygen concentration at high salinity (oxygen stress) and often low algae density (food stress) in salt works might explain this. Both oxygen stress and food stress have been mentioned as factors stimulating oviparous reproduction. However, an alternative explanation would be that females carrying nauplii and cysts are carried by water currents to the ponds located at the end of the system. We noted that the animal abundance in these ponds is usually much higher than in previous ponds. Furthermore, when working in static systems, cyst production does not increase with salinity. In addition, food stress can negatively influence brood size and if continued for long periods (one week) can lead to a significant decrease in cyst yields. Send = salinity in the pond after pumping. Oxygen is measured with a portable oxygen-meter. As oxygen levels change very quickly once the sample is taken, this parameter should be measured immediately after collection of the sample or best in the pond. While measuring, the probe should be moved constantly. Often oxygen levels will be higher at the surface than at the bottom especially when ponds are stratified. Oxygen levels also exhibit daily cycles. Concentrations are the lowest at dawn (algal respiration) and the highest in the afternoon (algal photo-synthesis). If problems with oxygen are anticipated, measurements should be made at dawn. As oxygen meters are very expensive and difficult to maintain, they should be used only if specific research studies on the effects of oxygen are conducted. The color and behavior of the Artemia will indicate when the animals are experiencing an oxygen stress (i.e. animals turn red, swim slowly, start surfacing and growth is retarded). Additional pumping, lowering the algae concentration or circulating the water in the pond will increase oxygen levels. Finally we note that oxygen stress has also been mentioned as a factor inducing oviparous reproduction, although results are not always unequivocal. In the field prolonged oxygen stresses usually result in poor growth, reduced reproductive output and mortality. pH is measured with a portable pH-meter. Meters should be properly calibrated before use. A cheap alternative, with acceptable accuracy for most purposes, is the use of pH paper. In their natural habitat Artemia are mostly found in a pH range between 7.8 and 8.2, which is often given as the optimal range. However, the effects of pH on growth and reproduction have not been studied so far. Moreover, some Artemia populations can be found in alkaline lakes, having a pH between 9 and 10 (i.e. Mono Lake, California, USA; Wadi Natrun, Egypt). Algae blooms can affect the pH (consumption of CO2). In general, the highest pH is reached in the afternoon while the lowest pH occurs near dawn. As sea water is usually well buffered, problems with pH are rare, except in areas with acid sulfate soils (see 4.5.4.1). Depth is best measured using calibrated sticks positioned in the pond. This is an important parameter to be recorded since it also has an effect on other measurements (such as temperature and oxygen). Furthermore, fluctuations in pond depth give information on pumping rates, evaporation, precipitation and leakage. The easiest way to estimate algae abundance is through the measurement of turbidity, which can be readily measured using a Secchi disk (Fig. 4.5.10). The disk is lowered in the water up to the point where the contrast between the white and black (or red) fields disappears, and the depth recorded. After lowering the disk a little more, it is then brought up slowly until the contrast is again visible and this depth is then also recorded; the average of both of the recorded depths being the turbidity. The turbidity also fluctuates during the day and is generally highest in the afternoon. Note that wind (concentration of algae in the down wind corners) as well as suspended solids (e.g. clay) can affect turbidity readings. Turbidity readings between 25 and 35 cm are optimal. At lower turbidity levels, extra pumping of nutrient rich water is needed (see 4.5.4.2). At higher turbidity, there is an increased risk of oxygen depletion at dawn. If time and equipment are available, algal density can also be estimated by analysis of the chlorophyll concentration. However, this method is only valid if combined with a proper sampling program. We refer the interested reader to specialized literature on this subject. As algae populations are seldom homogeneously distributed over the pond, recommendations as given for Artemia should be followed (see 4.5.6.9). The color of the water can give useful indications concerning the type of organisms present in the culture ponds. For practical recommendations in the field see Table 4.5.5. Of course if problems are encountered, more thorough analysis of the algae samples is recommended. Algae composition does not only influence growth and reproduction of the Artemia, but also has an effect on the nutritional value of the biomass and the cysts (e.g. fatty acid composition). Algae numbers can be increased through fertilization (see 4.5.4.2). A problem often encountered in Artemia ponds is the presence of benthic and/or filamentous algae. Both types of algae are unsuitable as food for the Artemia. Development of these algae can be prevented by keeping pond water turbid and deepening the ponds. Table 4.5.5. Recommendations concerning the type of organisms. Few organisms present/low nutrient level. High amount of suspended matter, probably clay/gypsum. Algae, probably green algae. When familiar with the site, different shades of green can be associated with different green algae. If combined with high salinity, Dunalliela sp or Halobacterium sp. Figure 4.5.11. Raking the Artemia pond in order to remove the benthic algae. 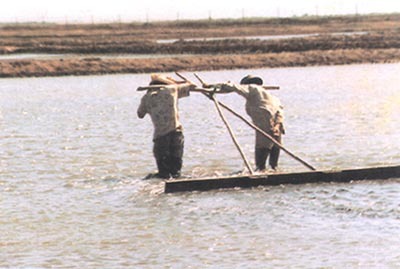 In Viet Nam, pond bottoms are raked daily, for removal of the benthic algae (Fig. 4.5.11.). Moreover, raking brings detritus (extra food for Artemia) as well as inorganic nutrients back into suspension. Similarly, soft pond bottoms appear to reduce the amount of benthic algae developing in the pond. If filamentous algae develop in the pond, they spread very quickly, finally interfering with cyst collection (i.e. the cysts being trapped in the filaments). To date, the only method used to reduce the amount of filamentous algae is by manual removal and raking, which is of course very labour intensive. The abundance of predators and competitors can be estimated by using similar techniques to those discussed for Artemia. Possible predators include fish (Aphanius, Tilapia), various species of insects (Corixidae) and some copepods. Rotifers and ciliates (Fabrea) are also possible food competitors. As mentioned in the previous chapters, careful screening of the intake waters and increasing salinity will keep their numbers within acceptable limits. As wading waterbirds (i.e. avocets and herons) also consume adult Artemia, bird scarers and wires stretched above the water near shallow places can help keep these predators away. Figure 4.5.12. 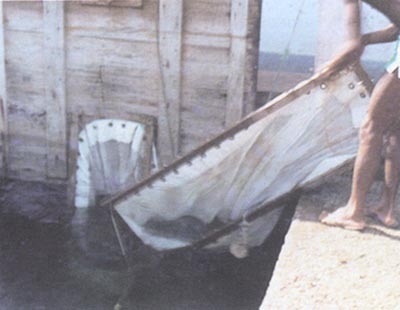 Raft with conical net used for Artemia biomass harvesting. Figure 4.5.13. Small net used for Artemia biomass harvesting. Figure 4.5.14. 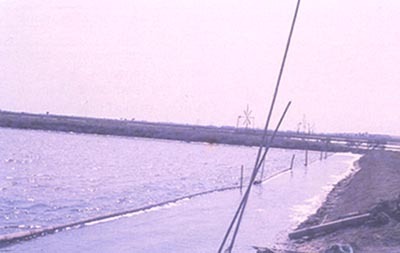 Installation of filter nets at the sluice gate for Artemia biomass harvesting in solar saltworks. · empty nets every hour; Artemia biomass accumulating at the end of the filter sac is exposed to anaerobic conditions which it can tolerate for up to 1 h; since Artemia is rich in proteolytic enzymes it is essential to harvest them alive. · after collection, biomass should be prepared for transport and further use or treatment. · same procedure as for a/but store at maximum 300 g wet weight biomass per liter of sea water. · Since Artemia is rich in proteolytic enzymes it is essential to process the biomass alive. · Freeze as fast as possible (thin layers, low temperature), slow freezing will result in proteolytic activity and leaching of essential nutrients when used subsequently. · If dried slowly (e.g. 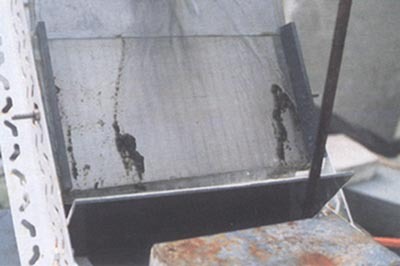 sun drying) excessive oxidation occurs (black coloring) and proteolytic activity will result in product losses. · Best quality biomass meal is obtained with freeze drying or spray drying. · Acceptable quality can be obtained with drum drying (flaking). · For economical feasibility consider a weight loss of 90% (Artemia biomass contains about 90% water) when drying Artemia biomass. 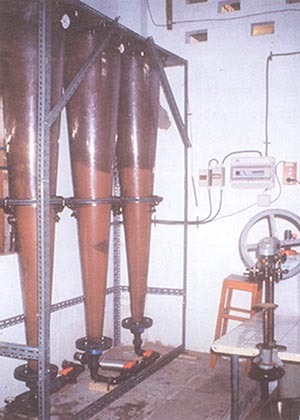 For detailed use of above mentioned drying/freezing techniques, we refer the user to specialized text books on food processing. Figure 4.5.15. Live Artemia transport bag and a transport styrofoam box containing several bags and ice. Figure 4.5.16. Storage net for Artemia biomass harvested from seasonal salt ponds integrated for Artemia production. Once the cysts are harvested, a number of processing steps should be carried out in order to obtain a clean, marketable product featuring acceptable hatching parameters and shelf life. As can be seen in Figure 4.5.17 the processing can be divided into seven consecutive processing steps, namely harvesting, brine processing, freshwater processing, drying, prepackaging, packaging and dry storage. Each processing step involves several processing activities and these are shown in Figure 4.5.17. Freshly-released cysts do not immediately develop into nauplii, even when the incubation conditions in the habitat are favorable. These cysts remain in a state of diapause which means that all metabolic activity is reversibly interrupted. Only after deactivation of this diapause can the cysts resume their development when incubated under acceptable hatching conditions (see also chapter 4.2.1.4.). An overview of strain/batch-specific diapause deactivation techniques which can be applied during certain processing steps/activities or which may interact with certain processing steps/activities are given in the column diapause deactivation of Figure 4.5.17 and will be further discussed at the end of this chapter. After being released, cysts float on the water surface and are gradually washed ashore by winds and waves. In places with changing wind direction, cysts may be carried around for a long period before they are thrown ashore. If these cysts are produced in low saline ponds (<100 ppt) or when salinity stratification takes place after rainfall, quiescent cysts may hatch. When water is very agitated and much foam develops, cysts get trapped and lost in the airborne foam. On the other hand, cysts which are washed ashore may be exposed to high temperatures, UV radiation and repeated hydration/dehydration cycles which in turn may decrease the viability of the final product. Furthermore, these cysts may also become airborne when dry. Maximum guarantee for good quality and at the same time reduced contamination with impurities are ensured when cysts are harvested from the water surface on a regular basis. Worksheet 4.5.1. summarizes pond modifications and collection procedures which may help to improve cyst harvesting and quality. The different brine processing activities and their respective aims are listed in Figure 4.5.17. Each activity and the possible interactions or combination with other processing activities is shortly described below (see also worksheet 4.5.2.). In order to improve storage conditions and/or to deactivate diapause (see also raw storage and diapause deactivation), cysts are usually dehydrated (to a water content of 20 to 25%) in saturated brine immediately after harvesting. When size and density separation equipment is located near the collection sites, brine dehydration is either combined with or performed immediately after density separation and size separation (see below). However, when there is a long period (up to several weeks) between collection and further processing it is advisable to perform brine dehydration before size and density separation in brine so as to avoid quality decrease. This involves the removal of debris larger and smaller than the cysts (i.e. feathers, sand, wood, stones) by screening the harvested product over different mesh sizes (i.e. 1 mm, 0.5 mm, 0.15 mm). For cyst material containing a lot of heavy debris (when collected from the shore), it is more efficient to perform a density separation in brine (see below) prior to size separation. Removal of heavy debris in the same size range as the cysts (when performed subsequent to size separation) is carried out through density separation in brine. Cysts submerged in brine float, while heavy debris (i.e. sand, small stones, heavy organic matter) sink. Density separation is often performed near production sites (due to availability of saturated brine) soon after harvesting. It can be combined with brine dehydration or the cysts can be transferred to a special brine dehydration tank or pond subsequently to density separation. - temporary storage (days or weeks) before the next brine processing activity, i.e. Figure 4.5.17. Overview of cyst processing (Modified from Lavens and Sorgeloos, 1987). Many strains can be stored in pond brine with a salinity as low as 100 ppt for several days at ambient temperature without a decrease in viability. When stored in low-saline brine, it is essential for the cysts to remain under hypoxic conditions to prevent initiation of the hatching metabolism. Hypoxic conditions can be obtained when stored at a relatively high ratio of cysts to brine (20 to 80% volume/volume) without aeration. In certain cases cysts have been safely stored in salinities as low as 80 g.l-1 for up to 2 months at ambient temperature under hypoxic conditions during which diapause is slowly deactivated (see also diapause deactivation methods). Storage in pond brine under hypoxic conditions for several days is often used as a temporary storage method between harvesting and further brine processing. After brine dehydration cysts can be stored safely for up to 1 month (some times for several months) at ambient temperature. The cysts can be stored in containers submerged in brine or alternatively, excess brine can be removed (i.e. by hand squeezing) and the semi-moist product can be stored in bags made of cotton or jute; the remaining brine will further leak from the bags during storage. When stored as a semi-moist product over longer periods (>1 week), in areas of high relative humidity, crude salt should be mixed with the cysts as to prevent the rehydration of the highly hygroscopic cysts. Storage in hypoxic conditions (in brine, 20 to 80% cysts volume/volume, no aeration) or with ample oxygen availability (as a semi-moist product) seems to have little influence on the optimal storage time provided the cysts are properly dehydrated. Eventually, the cysts should be stored in bags if transported over large distances (easy to handle, less weight). Apart from diapause deactivation as a result of the dehydration process itself, the storage (aging) in brine may further deactivate the diapause in certain strains/batches. Many cyst strains/batches may be stored for several months up to a year at temperatures between -20 and 4°C. For certain cyst species/strains, cold storage for several months is an adequate diapause deactivation method (see also specific diapause deactivation techniques). Due to the high costs involved and the limited availability of cold stores near the harvesting sites, cold storage should only be considered when this specific diapause deactivation method is needed. Although many strains/batches have been stored safely without proper dehydration, cysts are usually dehydrated in saturated brine and packed as a wet-dry product prior to cold storage. Cysts stored in saturated brine, may be used as a partially-cleaned semi-moist product within 2 to 3 months after harvesting. After 2 to 3 months of brine storage, the hatching percentage usually decreases (see Table 4.5.6). If required, a clean semi-moist cyst product can be obtained by applying a fresh water processing step. During the freshwater processing step, the cyst material is further cleaned through density separation and prepared for subsequent drying. As freshwater is used, the cysts will partially hydrate. If the cysts remain hydrated for too long a period under aerated conditions, the embryos will eventually reach an irreversible state of the hatching metabolism (i.e. cysts cannot be dehydrated without affecting the viability of the embryos). The exact time at which this irreversible state is achieved, is largely strain/batch specific but may be as short as 6 h. Even when cysts are dehydrated before reaching the irreversible phase of metabolism, their energy reserves may have been depleted to levels which result in a decrease of hatchability. To prevent prolonged metabolism and consequent depletion of energy reserves, freshwater processing should be limited to a maximum of 30 minutes. The different activities in the freshwater processing step are briefly discussed below, and the procedures given in worksheet 4.5.3. Before density separation in freshwater, excess brine must be removed in order to prevent salinity (density) increase of the water and consequently suboptimal separation. Cyst material submerged in freshwater will separate into a high density (sinking) fraction and a low density (floating) fraction. The sinking fraction contains mainly full cysts and some non-cyst material of similar density and similar size as the full cysts. Some empty cysts and cracked shells remain in the sinking fraction and can be removed at a later stage by air classification (see further). The floating fraction contains mainly empty and cracked cysts shells and light density non-cyst material of a similar size range. With some cysts strains, the floating fraction can still contain a significant amount of full cysts featuring a relatively high hatching percentage (i.e. 50 to 80%). However, because of the presence of empty shells and light non-cyst material, the hatching efficiency of this material is usually very low. When available, this cysts material can still be used as second grade product (eventually improved by air classification subsequent to drying; see pre-packaging). To reduce the bacterial load of the final cyst product (reduce oxygen demand during hatching, reduce concentration of pathogens), the cysts can be disinfected during the freshwater treatment. This can be carried out by adding hypochlorite (liquid bleach) to the freshwater separation tanks prior to adding the cyst material. The concentration of active chlorine in the freshwater of the separation tanks should be less than 200 ppm. If cysts are to be dried, they must be rinsed thoroughly with freshwater so as to avoid crystallization of the remaining salts during drying and consequent damage to the cyst shells. This rinsing can be carried out either before or after separation. Following separation/rinsing and collection in bags, the bulk of the freshwater can be removed by firm squeezing of the cysts. The cysts can be dehydrated in saturated brine for raw storage and use (within 1 to 3 months) as a clean semi-moist product. Alternatively, the cysts can be dried (see drying) for long term storage. This should be carried out immediately in order to prevent further metabolism and decreased hatchability. If the cysts are to be dried, further removal of excess water (10 to 15 kg water per 100 kg wet cysts) can be achieved by centrifugation. This will reduce the stickiness of the product and facilitate the drying process. It will also significantly reduce the drying time and consequently the required energy inputs. Finally, rehydration and subsequent dehydration as a result of the freshwater processing step can in some cases further deactivate diapause in dormant cysts (see specific diapause deactivation techniques). After freshwater treatment, the water content of the cysts should be reduced as soon as possible below the critical level of 10% in order to stop the metabolic activity and consequently ensure a long shelf life. Below a water content of 10%, little is known about the actual relation between water content and subsequent quality and shelf life. Usually a water content between 3 and 8% is aimed for. With regard to the optimal drying time, best results are obtained when a water content of 10% is reached within 8 hours or less. Few data are available on possible quality improvements when the drying time is very short (< 3h). Definitely, prolonged drying (i.e. >24 h) results in a decreased hatching percentage (possibly caused by a decrease of energy reserves). The maximal drying temperature is both strain specific and dependent upon the degree of dehydration of the cysts. For fully-hydrated cysts, temperatures below 35°C are usually safe. As the drying proceeds, water content decreases and cysts tend to be resistant to higher temperatures. If the freshwater processing cycle is limited to 45 minutes or less and excess water is properly removed, cysts are only partially hydrated (water content between 40 and 45%). Consequently they may resist higher temperatures (for some strains/batches up to 60°C). It is important to ensure a homogenous drying process. Uneven drying will result in some cysts drying very slowly and eventually not reaching a water content of 10%. This may cause both a decrease in hatching percentage and hatching rate, and a reduced shelf life. Spread the cysts in thin layers of uniform thickness (few mm only) on a drying rack (trays made with 120 µm screen). Best spreading is obtained when using a 3 to 5 mm-mesh filter basket through which the semi-moist cysts are granulated. Place the trays under a roof in the open air and assure good air exchange (above and below the tray) for effective drying. Do not expose the cysts to direct sunlight as this may result in critical temperature increases within the cysts (through heat absorption by the dark shell) or in UV damaging of embryos (especially when dealing with pale cysts). Redistribute the cysts at repeated intervals (initially every hour) so as to ensure a more homogenous drying (cysts at the surface tend to dry faster as they are better exposed to air with lower humidity). Drying should be continued until constant weight, i.e. until a water content below 10% is reached. In climates/seasons of high humidity, this may be difficult. Indeed, the higher the relative humidity, the longer the drying time. Moreover, a final equilibrium will be reached (if dried for long enough) between the water content in the cysts and the relative humidity of the air. For example, at a relative humidity of 70 to 75% cysts may reach a water content of about 10 to 15% after a maximum of 48 h, and drying for a longer period will not result in a lower water content. However, to avoid rehydration of the highly hygroscopic cysts during the night (relative humidity increases as temperature decreases) the cysts should be stored in watertight containers overnight, and drying continued the following day if necessary. Layer drying in open air is certainly the cheapest method requiring limited equipment. However, it may be difficult to standardize the drying, especially in areas with high and/or highly fluctuating relative humidity, poor standardization and slow drying, often resulting in fluctuating cyst quality. Moreover, due to poor mixing, small aggregates (lumps) of cysts may be formed which in turn may affect the overall quality of the final product. Place the drying racks in a temperature-controlled room or oven and assure a good air exchange. If possible fit a temperature control device to the heating system allowing a slow increase in temperature during the drying process (remember that as cysts get drier, the temperature resistance increases). Heating air significantly decreases the relative humidity thus improving the drying. For example, heating air with a relative humidity of 100% from 20 to 35°C will decrease the relative humidity to 45%. Always check the relation between temperature resistance and water content of the cysts you are using in order to find the most efficient temperature cycle and avoid overheating. This system offers better scope for standardization, especially if a temperature control device is fitted. However the drying may still be quite slow and the problem of cyst aggregates remains. A faster and more homogenous drying is achieved when cysts are kept under continuous movement in a rotary dryer (i.e. at 5 rpm). A schematic drawing of a rotary dryer is given in Figure 4.5.18. 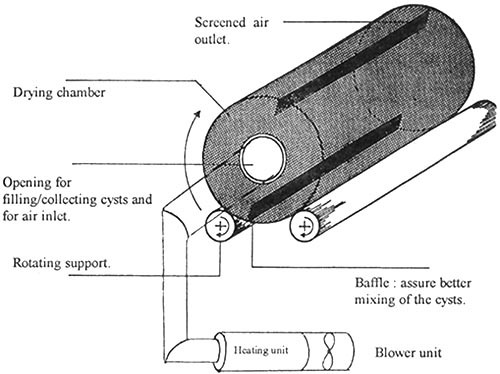 Continuous air flow through the drum is obtained with a ventilator fitted by means of an air duct to the inlet of the drum and a separate screened outlet allows discharge of the humid air. Baffles are often used to improve mixing of the cysts. However, it is better to fit a strong brush to the inside of the drum which rotates in the opposite direction of the drum. Apart from functioning as a mixing device, it will prevent the cysts from sticking to the sides of the drum, and thus reducing the formation of aggregates. Even more efficient drying can be achieved if a heater with a temperature control device is fitted to the air inlet. Although more expensive, a well-designed rotary dryer will allow a faster, more homogenous and better standardized drying process as compared to layer drying and consequently a better quality cyst product will be obtained. Figure 4.5.18. Schematic drawning of rotary dryer for Artemia cysts. The most efficient and most versatile drying is obtained by means of a fluidized bed drier (Figures 4.5.19 and 4.5.20). The basic design as outlined in Figure 4.5.19 consists of a conical drying chamber, a blower and a heating unit with temperature control device. The blower forces air over the heating unit into the drying chamber. A sieve at the inlet and outlet of the drying chamber allows free air flow without loss of air-suspended (fluidized cysts). The conical shape of the drying chamber ensures optimal mixing of the cyst product throughout the drying process which results in homogenous drying without excessive formation of cyst aggregations. Improved drying efficiency is further obtained by the heating unit. A first temperature sensor controls the inlet temperature (in certain cases as high as 90°C). Hot air which enters the drying chamber is immediately cooled down to temperatures below 35°C. As the cysts become dryer and more temperature resistant, evaporation decreases and the temperature in the drying chamber slowly increases. A second temperature sensor can be fitted inside the drying cone to avoid an increase of the cone temperature above critical levels (which are strain/batch-specific and should be tested) at the end of the drying process. Figure 4.5.19. Schematic drawing of a fluidized bed dryer for Artemia cysts. - 6 to 9 kW depending on ambient temperature. If the inlet and cone temperature are limited to respectively 80 and 40°C, a unit with the above specifications will dry approximately 35 kg of wet cysts in less than 3 h to a water content below 10%. Increasing or decreasing one of the temperature settings will result in a decrease respectively increase of the drying time. In any case the specific temperature tolerance of the strain/batch should be checked before applying the drying on a regular basis. Another advantage of the fluidized bed dryer is that it virtually eliminates the influence of the relative humidity of the inlet air (due to the high inlet temperature). Immediately after drying, the cysts should be transferred to air-tight containers or sealed polyethylene bags in order to prevent rehydration of the highly hygroscopic cysts. Although some cyst strains can be temporarily stored at temperatures as high as 30°C for several weeks, other strains may require storage in a cooler environment (below 10 - 20°C). Figure 4.5.20. 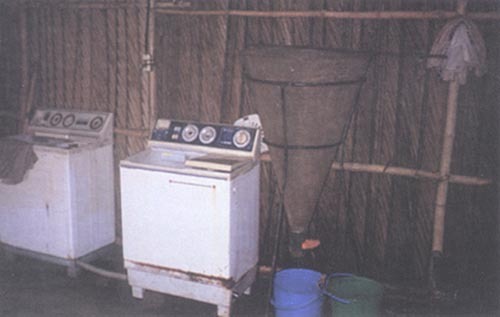 A fluidized bed dryer for Artemia cysts. During drying, especially with layer and rotary drying, small aggregations of cysts are usually formed. Although this might not influence the hatching quality of the cysts, the aggregates can be removed by dry sieving to improve the visual appearance of the final product. Cyst aggregates can be rehydrated in saturated brine and re-processed at a later date, or used as a second quality product if the hatching percentage decreases. Air classification is often applied to separate remaining empty and cracked shells which were not removed during freshwater separation. It can be carried out by releasing the dry material in a horizontal air stream in which heavy particles tend to fall down faster than lighter particles, e.g. cyst material blown through a horizontal air stream with several collecting vessels underneath will thus separate heavy particles (remaining non-cyst material or cyst aggregates), full cysts, and finally empty shells, cracked shells and light non-cyst material. When significant amounts of full cysts are still present in the floating fraction of the freshwater separation, they can also be dried and then air classified to separate these cysts from the empty shells. Finally, variations in the hatching quality of the dry cysts (i.e. as a result of seasonal variations in cyst quality) may require the mixing of different cyst batches in order to ensure a marketable product of constant quality. Any type of mixing equipment may be used provided that the cysts are not exposed to high humidity (so as to avoid rehydration). If available, a rotary type dryer can be used efficiently. The actual mixing process should take no longer than 5 to 10 min. Dry cysts should be packed in oxygen-free conditions so as to prevent the formation of free radicals (resulting in the irreversible interruption of the hatching metabolism). This can be carried out by vacuum or nitrogen packing. In order to ensure that the alveoles of the shell do not hold any more oxygen, nitrogen flushing should be repeated 2 or 3 times after vacuum treatment. Some examples of the effect of different storage conditions on the hatching percentage and hatching rate of Artemia cysts are given in Table 4.5.6 and Figure 4.5.21 respectively. Once the dry cysts are properly packed (vacuum or nitrogen), they may be stored for months or even years without too much decrease in hatching. However, apart from being subject to the packaging conditions (air/vacuum/nitrogen), the shelf life of dry cysts is usually strain/batch specific. Although some strains may be stored at room temperature, storage temperatures below 10°C are usually recommended. Again, the optical storage temperature is strain/batch specific. Table 4.5.6. The effect of different storage conditions on the hatchability (in %) of Artemia cysts from two localities (after Vanhaecke and Sorgeloos, 1982). As explained in the introduction, cysts are usually released in a state of (endogeneously controlled) arrested metabolism called diapause. In order to obtain a product with acceptable hatching characteristics, this state of diapause must be deactivated. Often a combination of different strain/batch-specific deactivation techniques is required to obtain optimal hatchability. In some cases the hatchability can simply not be improved above a certain level. In such cases it cannot be determined if this is due to the effect of diapause or simply to the viability of the embryo. The most common diapause deactivating methods used are described in chapter 4.2.1.4. However, before implementing any of these techniques, they should be tested for effectiveness. Figure 4.5.21. 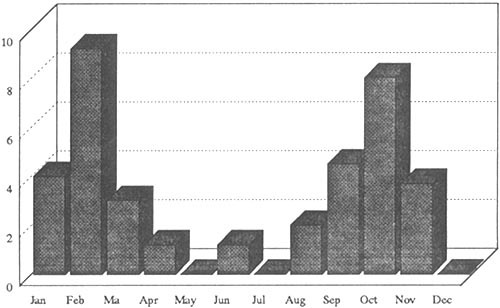 The effect of storage conditions on the hatching rate of Artemia cysts (after Vanhaecke and Sorgeloos, 1882). Bosteels, T., Tackaert, W., Van Stappen, G. and Sorgeloos, P. 1996. Improved use of the fluidized bed dryer for Artemia cysts. Aquaculture Eng., 15(3):169-179. Boyd, C.E. 1990. Water quality in ponds for aquaculture. Birmingham publishing Co., Birmingham. Alabama, USA. 482 pp. Clegg, J.S. and Cavagnaro, J. 1976. Interrelationships between water and cellular metabolism in Artemia cysts. IV. ATP and cyst hydration. J. Biophys. Biochem. Cytol, 88: 159-166. Drinkwater, L.E. and Clegg, J.S. 1991. Experimental biology of cyst diapause: 93-117. In: Artemia Biology. Browne R.A., P. Sorgeloos, and C.N.A. Trotman (Eds). CRC Press Inc., Boca Raton, Florida, USA, 374 pp. Eliot, J.M. 1977. Statistical analysis of samples of benthic invertebrates. Freshwater Biol. Assoc., Scientific Publication No.25. Godeluck, B. 1980. Etude comparée des récoltes et traitements des oeufs dArtemia salina des Salins du Midi en provenance de létang de Lavalduc. Thésis, Pierre et Marie Curie, Paris. 110 pp. Krebs, J.C. 1989. Ecological methodology. Harper & Row, Publishers, NY-USA, 654 pp. Kungvangkij, P. and Chua, T.E. 1986. Shrimp culture: pond design, operation and management. NACA training manual series No. 2. S. Sirikarnpimp, Bangkok, Thailand. 68 pp. Lavens, P. and Sorgeloos, P. 1987. The cryptobiotic state of Artemia cysts, its diapause deactivation and hatching: 27-63. In: Artemia Research and its Applications. Vol. 3. Sorgeloos, P., Bengtson, D.A., Decleir, W. and Jaspers, E. (Eds). Universa Press, Wetteren, Belgium. Seber, G.A.F. 1982. The estimation of animal abundance. Charles Griffin & Co. Ltd., London, UK, 654 pp. Sorgeloos, P. 1987. Brine shrimp Artemia in coastal saltworks: hydrobiological key to improved salt production and inexpensive source of food for vertically integrated aquaculture. 133-141. Proc. International Meeting on Saltworks Conversion for Aquaculture, Trapani, Italy, May 9-11, 1986. Tackaert, W. and Sorgeloos, P. 1991a. Semi-intensive culturing in fertilized ponds: 287-315. In: Artemia Biology. Browne, R.A., Sorgeloos, P. and C.N.A. Trotman (Eds), CRC Press, Inc., Boca Raton, Florida, USA, 374 p.
Tackaert, W., and Sorgeloos, P. 1993. The use of brine shrimp Artemia in biological management of solar saltworks: 671-622. In: Proc. 7th Intl Symposium on Salt, Kakihana, H., Hardy, H.R.jr., Hoshi, T., Tokyokura, K. (Eds). Vol. 1, Elsevier Science Publishers B.V., Amsterdam, The Netherlands. Vanhaecke, P. and Sorgeloos, P. 1982. International Study on Artemia. XVIII. The hatching rate of Artemia cysts - a comparative study. Aquacultural Eng. 1(4): 263-273. Vu Do Quynh and Nguyen Ngoc Lam. 1987. Inoculation of Artemia in experimental ponds in Central Vietnam: an ecological approach and a comparison of three geographical strains. 253-269. In: Artemia Research and its Applications. Vol. 3. Sorgeloos, P., Bengtson, D.A., Decleir, W. and Jaspers, E. (Eds). Universa Press, Wetteren, Belgium. · dig a short canal (1 to 2m wide, 3 to 6m long) on the down wind side of the pond to act as a cyst collection trap. - bamboo poles close to the shore (Figure 4.5.23). Add approximately 100 g of cyst material in a 250 ml graduated conical shaped container filled with brine. Mix thoroughly and leave to settle for 10 min. Cysts will float and heavy particles will sink. The volume percentage gives a first indication of the amount of heave debris in the cyst material. Moreover, if the heavy debris sink fast and are densely packed on the bottom, this indicates a high weight percentage of debris. - check the amount of full cysts by removal (dissolution) of the cysts shells; i.e. a small sample of cysts is suspended in hypochlorine solution (domestic bleach water); within 5 min the shells have dissolved and the (white to orange colored) embryos can be distinguished with the naked eye. - hydrate a small amount of cysts (100 to 200 cysts) for 2 to 3 h in fresh water and check for early hatchers. If many cysts are hatching (check for free swimming nauplii or umbrella stage with field microscope), the hatching metabolism has reached a late stage and subsequent processing will reduce the hatchability of the cyst product. - the harvesting period e.g. short time or long time after inoculation (probably due to differences between different brood cycles). Figure 4.5.22. Installation of cyst barriers to keep cysts in the water. Figure 4.5.23. Floating bamboo poles used as wave-brakers for the harvesting of Artemia cysts. Figure 4.5.24. Row of palm leaves close to the shoreline. Figure 4.5.25. Double-screen dip net. - for a high ratio of cysts to brine (e.g. 20 to 50% cysts to brine ratio on a volume/volume basis when using small brine tanks), exchange brine 2 to 3 times over 48 h to compensate for dilution due to release of water from the cysts. - collect material and proceed with next processing step or store temporarily using procedures described in section 4.5.7.2. - allow for longer dehydration time (3 to 4 days) as diluted brine (due to extracted cyst water) is slowly replaced by surrounding saturated brine. - use double screen dip-nets (Figure 4.5.25) and pond brine as described in harvesting procedures. - collect the cysts and proceed with the next processing step or apply temporary storage as described in section 4.5.7.2. - collect material in 0.15 to 0.5 mm size range and proceed with next processing step or store temporarily using procedures described in section 4.5.7.2. Figure 4.5.26. Harvesting cysts from seasonal salt ponds integrated for Artemia production. Figure 4.5.27. A vertical spin dryer (for removal of excess water) and a transparant conical shaped tank with a bottom valve (for density separation). · transfer brine-submerged cysts to bags (e.g. cotton, jute) and allow brine to leak out for 24 h.
· add hypochlorite (liquid bleach) to freshwater prior to adding the cysts and mix thoroughly. Figure 4.5.28. A 150 µm bag filter fitted in a slotted container for rinsing of cysts.